"Readers want to know what everybody else is talking about, and join the debate. So tracking what’s hot is, well, cool. 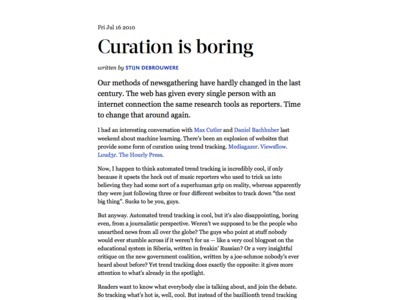 But instead of the bazillionth trend tracking app, I’d much rather see a tool that would use aggregation, machine learning and natural language processing to crawl the far outreaches of the web and spot obscure but valuable news or opinions that could enhance existing coverage. Like a robot army of researchers for every reporter, working 24/24 to suggest new angles and exciting topics we’ve missed. Topics everyone has missed."